January, 2013, Lexington, KY - The United States Equestrian Federation (USEF) is pleased to announce the winners of two prestigious awards in the discipline of Endurance, the Maggy Price Endurance Excellence Award and the Brunjes Junior/Young Rider Trophy. The awards were presented at the USEF Horse of the Year Awards gala and dinner on Friday, January 18, 2013 at the Louisville Marriott Downtown in Louisville, Kentucky. My plan was simple – in 1989, go to a few races for preparation, then take Rio to the North American Championship in Canada. Unfortunately, I was diagnosed with a degenerating disk at the end of 1988, so we modified the plan to have a friend ride Rio. At the first ride of the season, Rio took a bad step and strained his suspensory ligament. At that point I decided to rest him for 6 months so we could both recover. During the last half of 1989 and all of 1990, leading up to Sweden, I swam, worked out with weights and the Stairmaster machine. When I would get bored, I would imagine Rio winding deftly through the woods in Sweden. I would think about all the miles he had carried me without complaint. I only had to swim one mile, do 30 minutes on the Stairmaster! He went 50 or 100 miles every ride – but – he never seemed bored and certainly never complained. In addition to working out, I started taking riding lessons. Over the years, I had developed some bad habits, some of which hurt my back. Centered Riding, developed by Sally Swift, gave me new riding techniques that made riding much easier on my body. The program worked so well for me that I become a Centered Riding instructor and have taught clinics to endurance riders all over the world. Heather Reynolds tops the USEF Endurance ranking for 2012, with her husband Jeremy Reynolds coming in second. The Reynolds train in California in the summers and Florida in the winters. Third is Cody Boysen, with Steve Rojek 4th and Ceci Butler-Stasiuk 5th. Robin Schadt can't remember exactly what spooked her 13-year-old Arabian named Maruf as she rode the gelding through the Goethe State Forest in Levy County recently, but whatever it was scared Maruf enough that he ran into the dense woods and seemingly disappeared. "He dumped me. I took a pretty good hit to the head. It threw me for a loop and I'm fuzzy about the details," said Schadt, who was in the forest participating in a 22-mile endurance trail ride on Jan. 12. Schadt, a standardbred racehorse trainer based in Illinois, spends her winters in South Florida training younger horses for the race track. "Training is a six day a week job. When I can take a weekend off here or there, I like to participate in endurance riding," she said. She bought Maruf in 2008 specifically to participate in those types of rides. "The worst thing was hauling an empty trailer back. It's heartbreaking," she said. Lexington, KY - The United States Equestrian Federation (USEF) has elected a new Endurance Eligible Athlete Committee. For further information regarding the USEF High Performance Endurance Program visit; http://usef.org/_IFrames/breedsDisciplines/discipline/allEndurance.aspx. For additional information please contact Vonita Bowers via email at vbowers@usef.org. Lexington, KY - The United States Equestrian Federation (USEF) is pleased to announce the winners of two prestigious awards in the discipline of Endurance, the Maggy Price Endurance Excellence Award and the Brunjes Junior/Young Rider Trophy. The awards will be presented at the USEF Horse of the Year Awards gala and dinner on Friday, January 18, 2013 at the Louisville Marriott Downtown in Louisville, Kentucky. The Maggy Price Endurance Excellence Award, sponsored by Gold Medal Farm, and Larry and Valerie Kanavy, is in memory of Maggy Price, who was the 1992 FEI World Endurance Championship Silver medalist instrumental in the development of international endurance in the U.S. The award is presented to the Endurance Rider Ranking List athlete with the most points earned in the competition year. Heather Reynolds had a remarkable year claiming top honors at numerous endurance races in 2012. She began her year with a win at the Goethe Benefit Challenge CEI2* aboard her own Ta Tiran. Reynolds finished first with her husband Jeremy Reynolds' Stirgess at the FITS 160 km race and came in fourth a month later at the CEI3* USA Team Trial riding her own Riverwatch. At the Zone Team Endurance Challenge, she finished first in two races on her own horses - in the CEI2* with Bound for Honor and the CEI3* with Chanses. Reynolds finished out her year of strong performances by representing the U.S. aboard Riverwatch at the Longines FEI World Endurance Championship, where the U.S. team claimed fourth place. The Brunjes Junior/Young Rider Trophy is presented to the Endurance Rider Ranking List Junior/Young Rider athlete with the most points earned in the competition year. The Trophy is awarded in memory of Kathy Brunjes, who was a successful endurance athlete and an active supporter of the Junior/Young Rider program. Sixteen-year-old McCamey Kimbler had a stellar year, starting off with a win in February at the FITS CEIJY2*, riding Jeremy Olson's Noslo's Banjara. Her success continued with an impressive showing at the CEI3* USA Team Trial, finishing in 19th place on Samantha Sandler's Elliptic among the nation's top endurance riders. Kimbler had additional wins at the Spruce Woods CEIJY2* on Kelsey Kimbler's HV Cimmarons Goliath and at the Zone Team Endurance Challenge CEIJY2* on Kirsten Kimbler's Fringant. Note from his owner, Robin Schadt: We were riding the Gator Run 50 (orange loop) Saturday the 12th. Maruf and I were separated about 12 miles into the 22 mile loop. ... He was wearing a synergist saddle with a bright blue tolkat pad and a blue bridle/reins. I appreciate anything and everything anyone can do to help me find him." NOTE: Magoof was FULLY TACKED and BODY CLIPPED except legs and head. The next world championship was in Front Royal, VA, USA. Living out west, Rio was used to breathing and working in very dry air. To create a humid climate, I trained him with his stable sheet on over the saddle. It worked very well. I also made the decision to fly him to the east coast – a 15 hour day as opposed to 3 or 4 days driving across the country. Rio arrived at the ride site and settled comfortably into his stall, and did not seem bothered by the humidity. COLUMBIA — The South Carolina Horsemen’s Association Expo will be held at the S.C. Equine Park in Camden Feb. 9 at 10 a.m. The day-long expo features a myriad of horse-related activities for the hobbyist to the professional rider. The Expo has four presentations scheduled in the main arena, with concurrent demonstrations in separate areas. There will also be a horse health pavilion, children’s activities, and a silent auction along with numerous vendors. The first demonstration will be the Knights of the Guild-East, a jousting team that brings to life the pageantry and skills of long-ago knights on horseback. They will be followed by internationally known three-day-event rider Lellie Ward, whose teaching methods advocate riding through knowledge. Her Equine/Human Proprioception, or “body awareness,” is sure to open the eyes of many skilled riders to a new method of communication with horses. This is taken from a talk I presented for Equine Affaire and I will cover it in 3 parts. I hope you will please feel free to ask questions in the comments. The sport of endurance is one I never get tired talking about. After 30 years in the sport, I am still never happier than starting a ride on a good horse. Tonight I share my enthusiasm by revisiting some WC’s in the hopes that you too will see what is possible and that you continue to enjoy this sport to its utmost. Although I have competed on over 34 different horses, the very best of them was R.O. Grand Sultan, aka “Rio”. Without Rio, I would not be standing here before you. This talk, in a way, is a tribute to him. The first video in the background is of the endurance race at the World Equestrian Games in Sweden, 1990. The second is the WC in Spain in 1992 – the last 30 minutes.You will see when Rio crosses the finish line, his attitude and character. When the horse loves the sport as much as the rider, they give each other the determination and courage to go on. 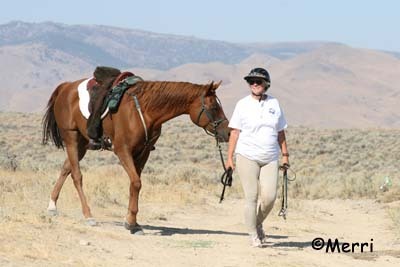 After completing Day 3 of the Death Valley Encounter Pioneer in California on December 30 2012, Carla Richardson and her 12-year-old gelding SS Kharady Khid +/ both reached the 9000-mile AERC mileage mark, in just 5 years of competing together. Kharady Khid +/ is now currently 24th in the AERC Lifetime Miles rank, and Khid and Carla show no signs of slowing down yet. "Onward to 10,000 miles for 2013!" Carla said. DIRECTOR-AT-LARGE ELECTION RESULTS: Congratulations to the following members who will be serving on the board for 2013-14: Tom Bache, Olin Balch DVM PhD, Randy Eiland, Susan Garlinghouse DVM, Terry Woolley Howe, Mike Maul, Stephanie Teeter, Bruce Weary DC. New board members will be sworn in at this March's convention.